With signature hand-wrought detail and a sleek, modern silhouette the Larchmont bench provides soulful occasional seating for bedroom or living room. 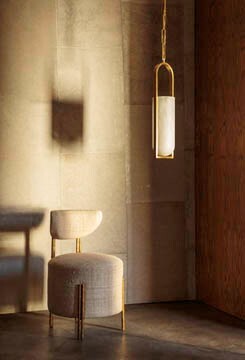 The legs are composed of a square profile Stainless Steel frame in a Pewter Patina with Burnished Brass sleeving details. The Turmont Bench is a bold and graphic seating option executed in lustrous Blackened Steel. Three low profile seat cushions offer comfort without interrupting the dramatic lines of this sculptural seating option.